Cars.com comes in just behind AutoTrader.com as one of the largest auto classified listing websites. It was founded in 1998, and while the headquarters are in Chicago, the website features listings from all over the country. Users can research cars to buy, place advertisements for selling or trading their car, or for connecting to local service centers for car repairs. The website is partnered with Kelley Blue Book, Yahoo!, and PBS. Cars.com is a very well-known service thanks to their focus on Super Bowl advertising. This website has three main sections. Buy, where users can search through car listings from dealerships and private sellers. Users can also research car models, read staff-created and user-created reviews, and even leave reviews themselves – on both cars and dealerships. The next section is the Sell and Trade section, where users can submit their vehicle for sale or trade, or use Cars.com’s tools to discover how much their car is worth. As a partner of Kelley Blue Book, this tool gathers very good information on your car’s value if you were to sell it to a dealership, or what you could ask if you were to sell it yourself. Finally, there is the Service and Repair section, where users can go to find local service centers, get estimates on repairs, find out if a car has been recalled or has had any safety warnings issued, and get tips on dealing with repairs and service centers. While Cars.com doesn’t offer quite as many comparison features as competitors, their array of services is impressive, and each section is incredibly easy to navigate and use. In three years as an accredited business on the BBB website, with an A+ rating, they’ve had 12 total complaints. For dealers, the reviews seem to be a mixed bag on Cars.com’s services. 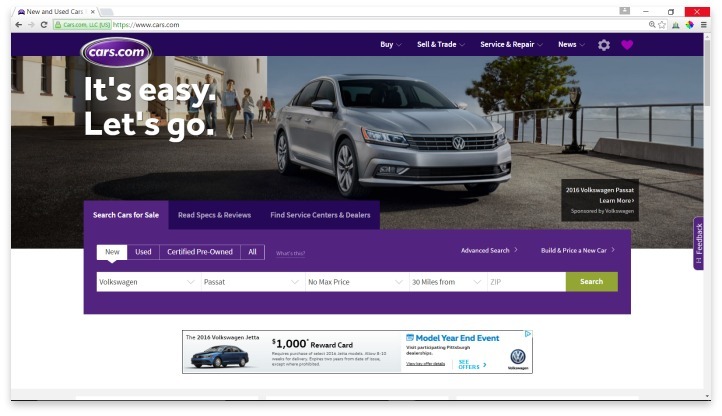 While many dealers praise the company’s easy uploading features and simple pricing plans, there is concern over the fact that Cars.com does not screen reviewers. Any user can leave a review of a dealership or car listing at any time, and there aren’t many options for having a false review removed. Cars.com relies on in-person customer representatives who visit dealerships and provide them with help setting up their account, getting more customer reviews, and making payments. Customer service for users can be reached through both a toll-free and a Chicago phone number; an email address; and an online contact form. They also operate active social media accounts on Twitter, Facebook, Google+, and even YouTube, where they create regular test drive videos and certified mechanic review videos. Cars.com lets users research cars to buy, place advertisements for selling or trading their car, or for connecting to local service centers for car repairs. Overall, Cars.com is a great place to start searching for a vehicle in your area. No matter what kind of purchase you want to make – through a dealer, a private owner, a new car, or a used car – Cars.com has you covered. And their ability to help you research vehicles and their values only makes it easier. Plus, you can continue to rely on Cars.com after you buy with their service and repair connections, and their tips on car maintenance. If you truly want to start with a trusted car listing service that you can use again and again, Cars.com is a solid option that will meet just about any need. Have you had an experience with this company? Please share your Cars.com reviews below.